A host of diamond pendant designs, made up with beautifully cut and polished fancy shaped diamonds in solitaire and drop designs. Uniquely styled solitaire triangular pendant crafted with a natural Trilliant cut diamond. Available with a choice of diamond sizes, crafted individually to order in a selection of precious metals including 18ct White Gold, 18ct Yellow Gold, Platinum and Fairtrade Gold. Trilliant-cut diamond. Triangular brilliant faceting. 3 claw pendant design. Choice of diamond carat weights, colours and purities. Includes 18-inch chain. Beautifully packaged with presentation box. 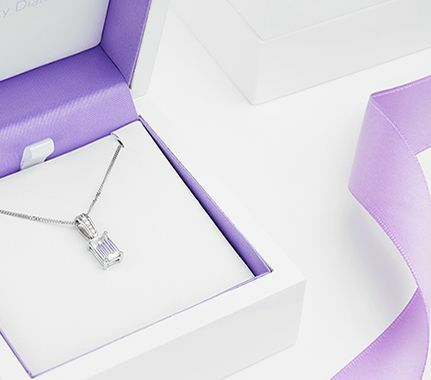 Modern classic, ideally proportioned 3 claw diamond solitaire pendant created in the most favoured diamond drop design across a range of diamond sizes and qualities. Elegant classic pear shaped solitaire design. We offer this design in a wide range of carat weights, diamond colours and diamond clarities. We build each pendant around the diamond with a very neat 3 claw setting. Cost includes 18 inch chain supplied. Dazzling 4 claw rectangular radiant cut diamond solitaire pendant with modern setting and supplied with 18 inch chain. Radiant cut diamond. Choice of diamond carat weights, colours and clarities. Simple, modern 4 square claw setting. 18 inch chain supplied. Wood boxed. Gift packaged. Approx. 14 working days for manufacture. Elegant marquise diamond solitaire pendant, featuring a beautifully cut, dazzling marquise diamond in a two claw setting with chain. Two claw setting. V claw detail. Swinging bale. 18 Curb chain supplied. Wood box. Gift packaged. Wide range of sizes available. 18ct White Gold, Yellow Gold and Platinum. 14 working days delivery. Beautifully styled and simple modern oval brilliant cut diamond solitaire pendant with elegant 4 claw setting. Four claw setting. Classic oval diamond solitaire design. Supplied with 18 chain. Available with varying options. Available in 18ct White Gold, Yellow Gold and Platinum. Wood box. Gift packaged. Approx. 14 working days delivery. 4 claw diamond solitaire pendant, set with your choice of rectangular white Emerald cut diamond, provided inclusive of chain. Four secure claws. Loop for chain. 18 chain supplied. Choice of options. Available in 18ct White Gold, Yellow Gold and Platinum. Wood boxed & gift packaged. 14 working days delivery. Romantic and timelessly adorable, heart shaped diamond solitaire pendant, crafted to your exact chosen options in a simple 3 claw pendant setting. Heart shaped diamond. Claw setting. Protective V claw. Small loop for chain. 18 chain supplied. Available in 18ct White Gold, Yellow Gold and Platinum. Supplied boxed. Gift packaged. 14 working days for delivery.